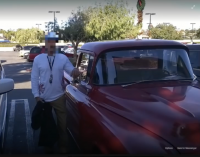 Nearly three years after Bob Brown of Grover Beach had his 1957 red Chevy pickup truck stolen from a grocery store parking lot, the vehicle owner has been reunited with his classic pickup. A quite improbable chain of events led to Brown getting his truck back. In Dec. 2015, a thief stole the 1957 Chevy from the Vons parking lot in Grover Beach after Brown left the vehicle unlocked. Brown said in a video interview with the National Insurance Crime Bureau (NICB) that he did not expect to ever get the truck back. Grover Beach police circulated images of the truck on social media, and multiple agencies investigated the theft. A San Diego County auto theft task force located the theft suspect and his girlfriend and arrested them for unrelated offenses. But the suspect denied stealing the vehicle, and investigators could not locate the truck in San Diego County, Grover Beach Police Commander Angelo Limon told the NCIB. However, the suspect posted a photo on Facebook bragging he got the truck as a Christmas present. He quickly sold it to someone who took it to Mexico, according to the NCIB. NCIB special agent Robert Hogan, who used to have a 1955 Chevy pickup, saw the police report about the stolen truck. Hogan decided to enter the information in the NICB database, even though the truck did not have insurance for the theft when it was stolen. Two and a half years later, a vendor in Tijuana who works with NICB found the truck in a salvage yard in Mexico. Hogan said the truck was not in bad shape upon being located in Mexico. He informed Brown, who paid the fees to bring the vehicle back across the border. Brown is now spending about $20,000 to restore the truck. He is also changing the truck’s color from red to white. The Grover Beach Police Department said in a Facebook post the auto theft suspect in the case was sent back to prison after being arrested on various charges. Grover Beach police also commended the work of public and private partner agencies in bringing Brown his truck back.